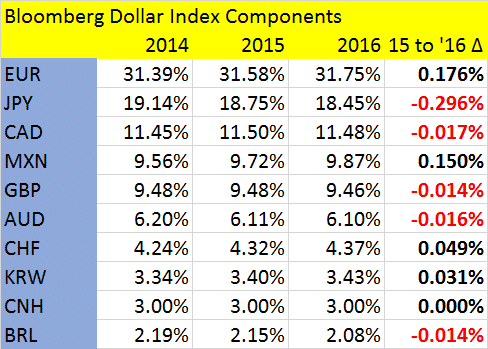 Nearing 2016, Bloomberg has announced the rebalanced target weights that it will be using for their Bloomberg Dollar Spot Index (BBDXY) in 2016. The weighting of the index is rebalanced yearly, and contrasts with the popular cited US Dollar Index (symbol USDX or DXY) which has been changed only once since its creation in 1973. The single rebalancing took place in 1999 with the creation of the euro. 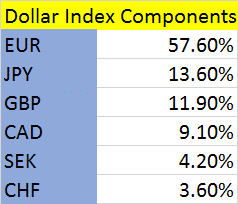 Due to the USDX’s lack of rebalances and omission of emerging currencies such as the renminbi and peso, other indexes such as the BBDXY which have more diversified components have gained followers. Launched in 2013, as a dynamic index, mutual funds using the index as a benchmark include WisdomTree’s Bloomberg US Dollar Fund. Updating their index, the euro continues to be the most heavily composed currency in the index, representing 31.75% compared to 31.58% in 2015. Among currencies seeing their weighting increase, the largest is the Mexican peso, with holdings in the currency expanding by 1.54% to 9.87% from 9.72%. The euro and peso are joined by the Swiss franc and South Korean won as the only currencies to see their weighting increase in every year since 2014. Seeing its weighting decrease was the Japanese yen, as its percentage weighting has dropped from 19.14% in 2014 to 18.45% in 2016. The decline occurs as the currency has devalued against major currencies due to inflationary policies being introduced in Japan since the end of 2012. Among other currencies, weighting in the Chinese yuan has remained at 3.00% since 2014, even as China has recently taken initiatives to devalue their currency with the USD/CNH rate rising from just above 6.20 in August to a current 6.55.